When the low fuel level is reached, this warning lamp comes on on the instrument panel, accompanied by an audible signal and an alert message. When it first comes on, you have approximately 6 litres of fuel remaining. Until sufficient fuel has been added, this warning lamp comes on every time the ignition is switched on, accompanied by an audible signal and a message. When driving, this audible signal and the display of the alert message are repeated with increasing frequency as the fuel level drops towards "0" . Refuel as soon as possible to avoid running out of fuel. If you run out of fuel (Diesel), refer also to the "Checks" section. 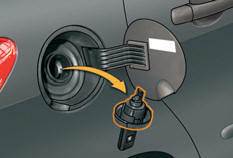 With Stop & Start, never refuel with the system in STOP mode; you must switch off the ignition with the key. A label affixed to the inside of the flap reminds you of the type of fuel to be used according to your engine. fill the tank, but do not continue after the 3rd cut-off of the nozzle ; this could cause malfunctions. 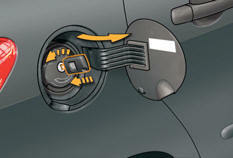 A fuel gauge malfunction is indicated by the return of the fuel gauge needle to zero. Opening the cap may cause an inrush of air. This vacuum, which is perfectly normal, is caused by the sealing of the fuel system. The use of any other type of (bio) fuel (vegetable or animal oils, pure or diluted, domestic fuel...) is strictly prohibited (risk of damage to the engine and fuel system).